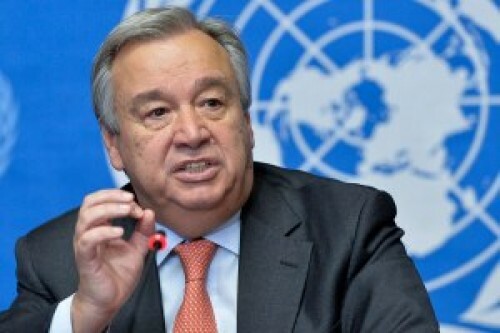 United Nations : UN Secretary-General Antonio Guterres announced on Tuesday the appointment of Major General Jose Eladio Alcain of Uruguay as head of mission and chief military observer for the UN Military Observer Group in India and Pakistan (UNMOGIP). Alcain will succeed Major General Per Gustaf Lodin of Sweden, who will complete his two-year assignment in July 2018, Xinhua reported. Alcain has had a distinguished career with the Uruguayan Army since 1977. Most recently, he held the position of Director of the National Health Service of the Armed Forces (2015-2018). Prior to this, he served as Third Mechanized Cavalry Brigade Commander and as Director of the Architecture and Engineering Section of the National Health Service of the Armed Forces (2012-2013). He also worked as instructor at the Uruguayan Peacekeeping Training Centre (2000-2017) and the Uruguayan War College (2003-2018). Alcain has extensive peacekeeping experience, having served in five peacekeeping operations, including UN Assistance Mission for Rwanda (UNAMIR) (1994-1995), UN Angola Verification Mission III (UNAVEM) (1996-1997), UN Iraq-Kuwait Observation Mission (UNIKOM) (1999-2000), UN Organization Mission in the Democratic Republic of the Congo (MONUC) (2003-2004), and UN Stabilisation Mission in Haiti (MINUSTAH) (2006-2007 and 2011-2012). He graduated from the Uruguayan War College and is currently pursuing a master's degree in political science from the Uruguayan National University. He has also attended the UN senior mission leaders course in 2017. Born in Uruguay in 1961, he is married and has two children.